Where Were You For Super Bowl LIII? Having spent the first thirty years of my life on one river, I spent the next thirty on the west side of the state. I’ll be #foreverblue, loyal to the Royals; and sometimes, I still wear red on Fridays for the #Chiefs. Not that I care about the actual play, but home town pride creates a certain level of excitement that we carry with us everywhere we roam. I watched the Chief’s play-off game through the Google Lady, asking her every few seconds, what’s the score. She and I both died a little at the end. The park in which I live had a Super Bowl party three or four weeks after I moved here, January 2018. Nervous, alone, and worried about making a good impression, I hovered in the background. I have no clue who played or won. But I will remember the afternoon as my introduction to #deltalife, and to the community of Park Delta Bay. This year, though — oh what a difference! I know about a third of the full-time residents by name. I wave to the right and left driving in or out. I take the place for granted sometimes. It’s where I live. It’s home. Angry at the entry of the Patriots into the game, nonetheless the Super Bowl Committee threw themselves into planning. As for myself, I got chips, guac, salsa, and carrots. I brought the oil and popcorn for the machine. Somebody grilled hot dogs. Another person brought 7-bean dip. Wings appeared, and sliced sausages, and a plate of brownies. Eventually the counter in the community room groaned under the weight of the potluck provisions. I won the pool. I have no idea how. I picked five boxes and the person collecting guesses initialed for me. 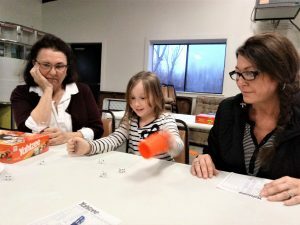 I spent the afternoon playing Yahtzee with Teresa, the lady who lives five lots to the east of me; Sally from the far side of the park; and a five-year-old girl named Ella who turns out to have mad dice-rolling skills. Each adult won a game. Ella played as a team with Teresa. 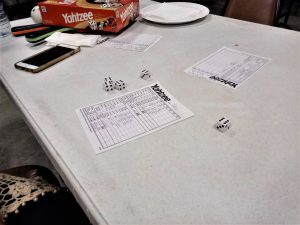 Sally got the only Yahtzee! We must have had more fun than the group watching the football game, because we got scolded for being too loud three times. By sports fans. Now that’s what I call a party. It’s the third day of the sixty-second month of My Year Without Complaining. Life continues. This entry was posted in Uncategorized on 04 February 2019 by ccorleyjd365.